Extracted from An Introduction to Political Astrology (Mundane Astrology), by Charles Carter, 1951; (Republished 1980 by Camelot Press Ltd), p.54. 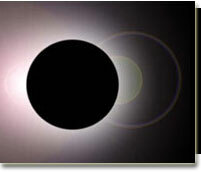 "A number of attempts have been made to determine how long the "effects" of eclipses endure. It is suggested that these inquiries are erroneously conceived. To reason by analogy: how long do the effects of a blow last? Clearly two factors are involved - the violence of the impact and the susceptibility of the object struck. A blow by a hand on a stone has no effect on the stone; a blow by a knife on soft flesh may inflict a lifelong injury. Thus, we must consider how "violently" an eclipse affects the figure under consideration, and that must depend upon how closely it falls to sensitive points therein; and we must further consider how susceptible, or sensitive, that spot is. 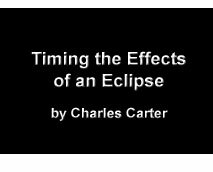 If the eclipse does not fall nearer than, say, five degrees of any important body or point the "effect" will be negligible even at the time and certainly will have no duration. But if it falls on the very degree held by a body and if, in addition, that body is highly sensitive owing to its radical condition, the so-called effects may be serious and long lasting. Nevertheless it is true that an eclipse may produce little or nothing at the time but may apparently correspond to something important but occurring some considerable time later. The most usual times seem to be when the Sun comes to the next square of the place of the eclipse, i.e., three months later, or when a planet, particularly Mars, transits the place of the eclipse."